Natural products still play an important role in the medicinal chemistry, especially in some therapeutic areas. As example more than 60% of currently-used anticancer agents are derives from natural sources including plants, marine organisms or micro-organism. Thus natural products (NP) are an high-impact source of new “lead compounds” or new potential therapeutic agents despite the large development of biotechnology and combinatorial chemistry in the drug discovery and development. Many examples of anticancer drugs as paclitaxel, combretastatin, bryostatin and discodermolide have shown the importance of NP in the anticancer chemotherapy through many years. Many organisms have been studied as sources of drugs namely plants, micro-organisms and marine organisms and the obtained NP can be considered a group of “privileged chemical structures” evolved in nature to interact with other organisms. For this reason NP are a good starting points for pharmaceutical research and also for library design. 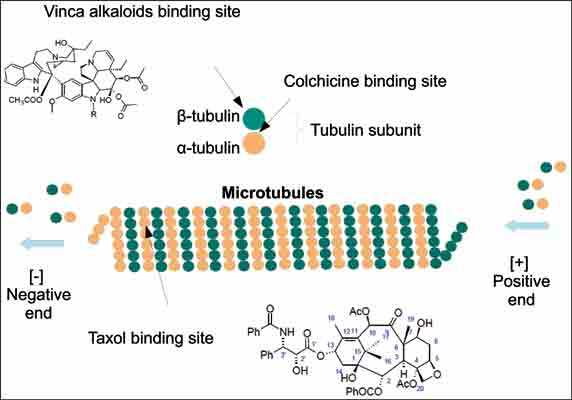 Tubulin and microtubules are one of the most studied targets for the search of anticancer compounds. Microtubule targeting agents (MTA) also named antimitotic agents are compounds that are able to perturb mitosis but are also able to arrest cell growing during interphase. The anticancer drugs, taxanes and vinca alkaloids have established tubulin as important target in cancer therapy. More recently the vascular disrupting agents (VDA) combretastatin analogues were studied for their antimitotics properties. This review will consider the anti mitotic NP and their potential impact in the development of new therapeutic agents. Natural products, Antimitotic agents, Tubulin, Anticancer. Department of Pharmaceutical and Pharmacologycal Sciences, University of Padova, Via F. Marzolo 5, 35121, Padova, Italy.